I was not a fan of mint ice cream or mint chocolate or anything minty except chewing gum, but I now definitely am of this Carrot and Mint Soup. This carrot & mint soup is adapted from Saransh Goila’s recipe on his Facebook page. This soup recipe is a keeper. 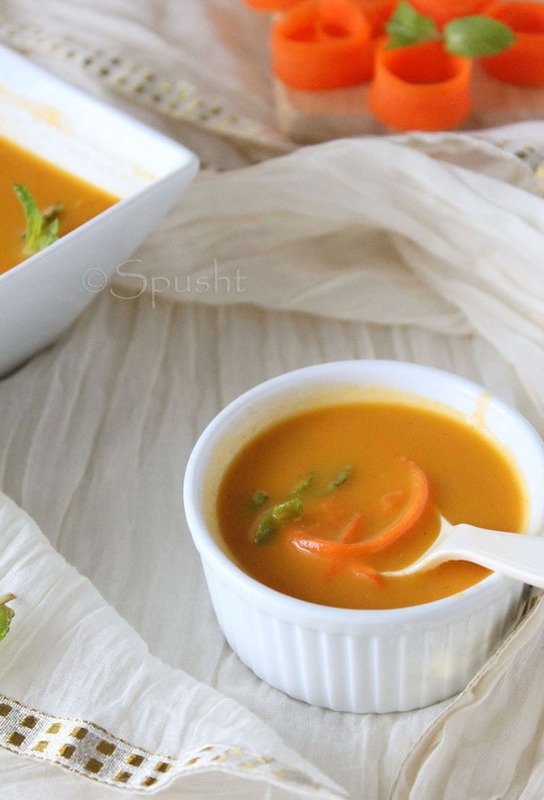 Read the recipe, see the pictures, and tell me, isn't it perfect for winters!? 1. Heat olive oil & butter in a large saucepan & sauté the next 6 ingredients over medium heat until soft & translucent. 3. Bring to a boil, and let simmer, covered, over medium heat for about 20 minutes, until the carrots are soft. Purée the soup in a blender (or food processor) until desired smoothness. 4. Stir in the honey, if using, and the crème fraîche. Taste & adjust the salt & pepper at this point, and serve hot. Garnish the carrot and mint soup with a mint leaf & some cream. I also added in some carrot strips cut very thin & long, like noodles. Instead of crème fraîche I used heavy cream, and kept it thick & creamy as the chef wrote. 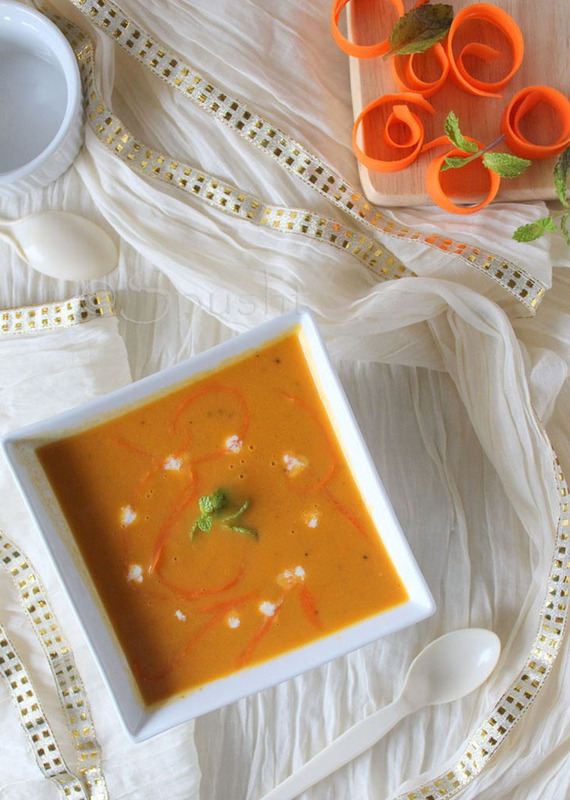 Not only does this Carrot & Mint Soup smell good, it tastes delicious & the color looks great too – THAT’S what I believe is a winner – food that appeals to all senses. Just wish I could hear it too. Ha! A warming and tasty soup. Love the addition of mint. I did not go to the top of the Ranthambore fort but I really enjoyed the safari. I LOVE mint icecream AND mint chocolate everything! I also have a feeling I'm going to love this recipe! Thanks for sharing! A great flavor and color combination! This soup must be delicious. love those carrot ribbons on the side! i am game for this perfect color combination! Your photos are lovely- You've made this simple soup look incredible elegant, and worthy of a fancy occasion! Love the color combination. The soup looks so vibrant. Very nice. These pictures are telling their own story. Totally lovely! I simple love your clicks! They make the recipe sound even more delicious!